On a chilly April evening we joined a huge crowd to welcome this awesome mechanical metal puppet as the story of mining and copper smelting was told at the site of a former copper works in the Swansea Valley. Before the main event we entertained the audience with a selection of songs, conducted by D. Huw Rees and accompanied by Hywel Evans, trying hard to keep his “piano fingers” warm. We then chanted “Copr a Dur” (copper and steel) as we wove our way through the crowd to the stage. 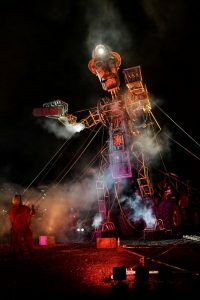 The 11.2 metre-high “puppet” was operated by a team of twelve “miners”, with much noise, sparks, and flame as the history of Cornish ore mining and copper smelting in our area was told. We then sang a Lament and a Requiem, specially composed for the event by Helen Woods. As it was dark by this time, we had to deploy smart-phone torches in order to see the words and music! This was the finale of the Man Engine’s tour of five historical industrial sites in South Wales, and one we will remember not only for our frozen feet, but also for the drama, sounds, smells and sights of this amazing production. Photo courtesy of Wales Online.